CLEtoSEA – Page 2 – My cross-country journey and search for a new life. If you’ve been reading this for a while, or if you follow me on Twitter or in real life, you know that I’ve been pretty passionate about yoga lately. Certainly, I’ve been periodically practicing for the past few years, finding a few studios here and there that I’ve really loved (Shoutout to Replenish in Columbus and YogaRoots in Cleveland), but only recently did I begin practicing on a more regular basis. Yoga really stepped into my life at a moment where I really needed it; having been diagnosed with a low lumbar stress fracture and essentially being unable to finish the final season of my one of my true passions, hurdling, I was left feeling down on myself and my physical condition. My physical therapist put me on a no-run plan for an indefinite number of weeks, which devastated me. I needed something, anything, which would make me feel strong and capable the way running, and, specifically, hurdling, had. Enter yoga. I was told I had a weak back, extremely-tight hamstrings, and the combo of the two would mean a series of back injuries for the rest of my life if I did not change my tune, so I decided to give yoga a more serious try. I bought a month’s package at Studio Oxygen in my hometown and padded in to my first class amid all of the Fit Soccer Moms of Canfield (they should really have a reality TV show about these women). I was hooked–by the end of the summer, I really felt more flexible–I could put my full palm on the ground in standing forward fold!–and stronger than ever, which allowed me to begin running again (I raced a 2 mile at the very end of August and actually hit a PR, which was huge for me–I hadn’t been able to hit a PR in anything running related in over a year, which was extremely frustrating and exhausting–but that’s another story for another time). Seeing the good it has done in me for such a short period of time, I knew at this point that yoga must become a regular part of my life–but how? The other day, I was walking back from my local Trader Joe’s (or Heaven, as some people know it), having picked up some organic and natural products for a low price, when I stumbled upon a sign that read “Yoga to the People.” Puzzled, I did a quick Google search, which informed me that this was a yoga studio that offered donation-based Vinyasa and hot yoga Bikram-style classes. Donation based essentially means you give what you can, with a suggested donation of $10 per class. Now, $10 per class was pretty much cheaper than any yoga studio I had ever seen, save for the free classes with Amy back in the John Carroll University Rec Center, so I was sold. The next day, I pulled my hair into a top knot, packed my mat and a water bottle, and walked to the studio for a donation-based 60 minute Vinyasa class(it’s less than a mile from my apartment!). Upon walking in, I was greeted by the desk worker, who took my donation and directed me toward the women’s locker room, where I could lock up my stuff and get prepared for class. This was truly the most intrinsically yoga experience I’ve had to date. 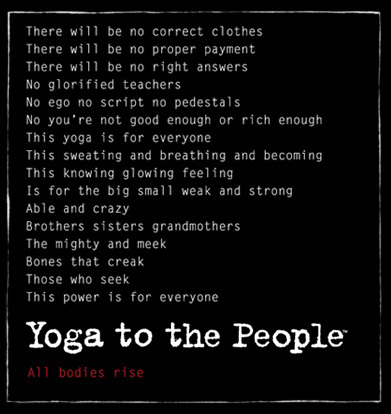 People of all walks of life (and in various states of dress) entered the room and joined together in the same practice of yoga. Man and woman, old and young, each paying what they could, doing yoga as it was intended to be practiced. It was truly a poetic experience. I will certainly be back! Yoga for everyone–isn’t what it is all about? Namaste. 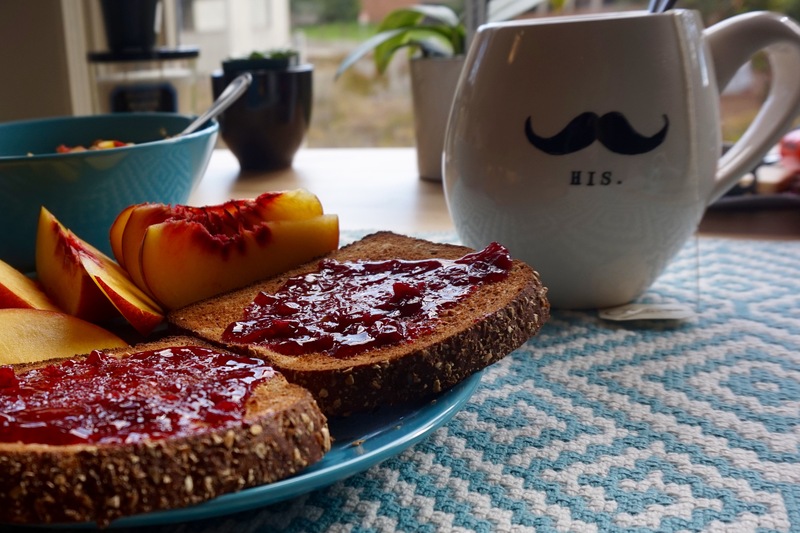 This breakfast brought to you by a song and dance party. As Three Dog Night once wisely put, “One is the loneliest number.” But is it really? I have spent a week entirely alone in an unfamiliar city (my mom and dad left me last Tuesday evening to head back to Ohio) and I don’t really feel that alone. But, at the same time, I also do. It’s a very strange feeling living alone in a city–you’re never really alone, but then you are all at the same time. Some people love this environment–they are meant to be alone to harness their true potential. I do not quiiiite fit into this category. Yet, I’m not the opposite extreme; I do not need to surround myself with everyone I know in order to feel secure or happy. I find myself somewhere in a happy medium: I enjoy being alone and can competently survive alone, but for me to thrive I desire some form of human interaction or enjoyment in order to make my life feel worthwhile. Luckily, in a city like Seattle, this is not too hard to come by. Certainly, it will be easier once school starts and I can interact with my professors and peers on a daily basis (and maybe even make some *gasp* friends), but until then, I am getting by. Like going to college or working in retail, I honestly think everyone should live alone for at least some portion of their lives. Or, on a smaller scale, they should at least spend some time on their own. 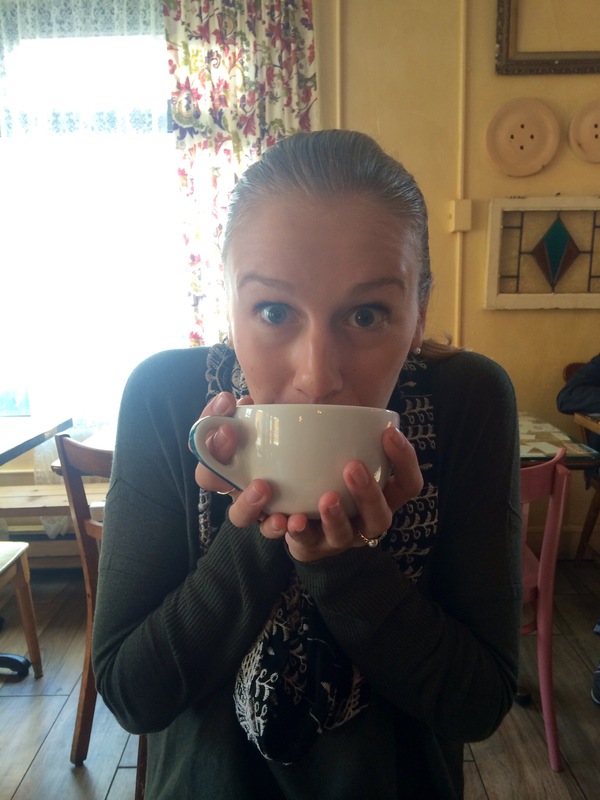 When I was in undergrad, my favorite alone-time moments were either when running, eating a solo breakfast or lunch, or during my almost-weekly adventures to a local coffee shop that I love. It was great to just spend a few hours by myself, in my own thoughts, and being my own intrinsic, pure self. I cherished these moments, and would suggest them for anyone. It’s important for everyone to learn to spend at least a little time by themselves. It is truly a great period for personal growth. After spending a week essentially alone, I have found, in myself, a few tendencies that I will share with you. Maybe these are akin to something you find yourself doing in your own life, or maybe they will help you in your alone moments. I spend most of my days searching for some form of human interaction. Some times I am just not in the mood to spend the entire day with myself, so I go out in search of people to just be around. Luckily, this city provides me many opportunities and spaces to do this. Some of my favorite days I will just go sit at a coffee shop (like I am right now), drinking some coffee and reading a book, taking in the environment of the place and the presence people around me. Other days, I adventure to weekly happenings like farmer’s markets or craft/flea markets, just to be among other people (and of course to partake in some wonderful shopping or window shopping). My good friend, Nick S. told me this would happen, and he is certainly correct: whenever I do have the opportunity for a genuine human interaction, I do not back down. This is best illustrated in my visit to Trader Joe’s this morning: I started up a lengthy conversation (lengthy given that she was a complete stranger) with a woman in the nut aisle because she was struggling to find the walnuts. I also struck up a solid 3-4 minute conversation with my cashier about their wonderfully delicious Chocolate Coconut Almonds (if you have not had these I would highly recommend them). I play music almost constantly in my apartment. It helps fill some of the empty space that somehow exists even though my apartment is only slightly larger than a large dorm room. Spotify has become my best friend in this regard–their themed playlists have been a huge help. I would also recommend 8Tracks for this, as it has a number of pre-made playlists you can search for by mood/genre. This is fun, as it makes almost everything into a dance party–cooking, cleaning, and getting ready for the day become a lot more fun with my own personal soundtrack! If you have any good Netflix recommendations, please let me know in the comments below! All in all, these seem like pretty harmless activities, so I’m certainly not complaining. I cannot believe I’ve been here for a full week! 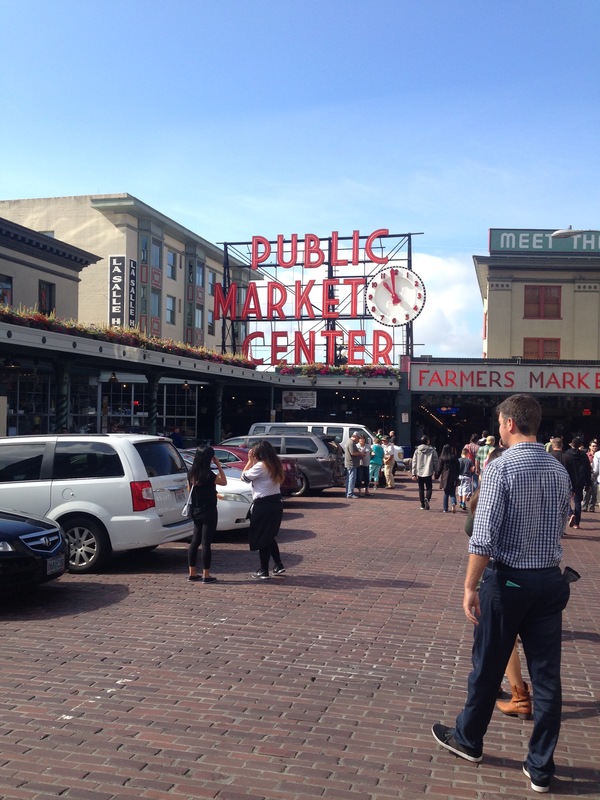 After a few days of moving my life into my apartment, I immersed myself in the city of Seattle, as I have detailed in previous posts. 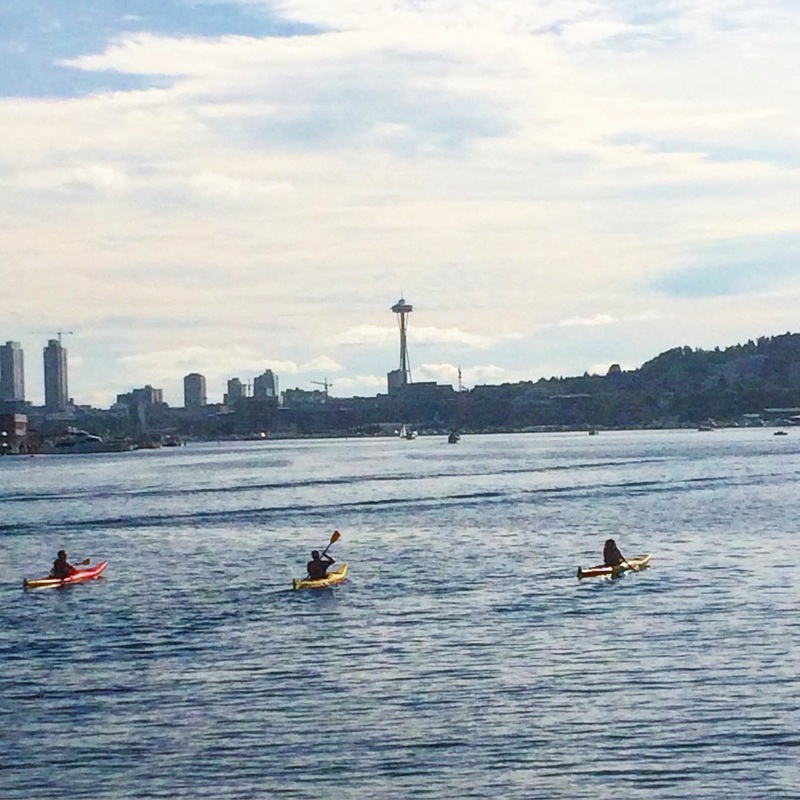 Running with the active early risers, drinking coffee among the cafe dwellers, biking with the Burke-Gilman lovers, relaxing in the local parks… I’ve really enjoyed my time here so far. 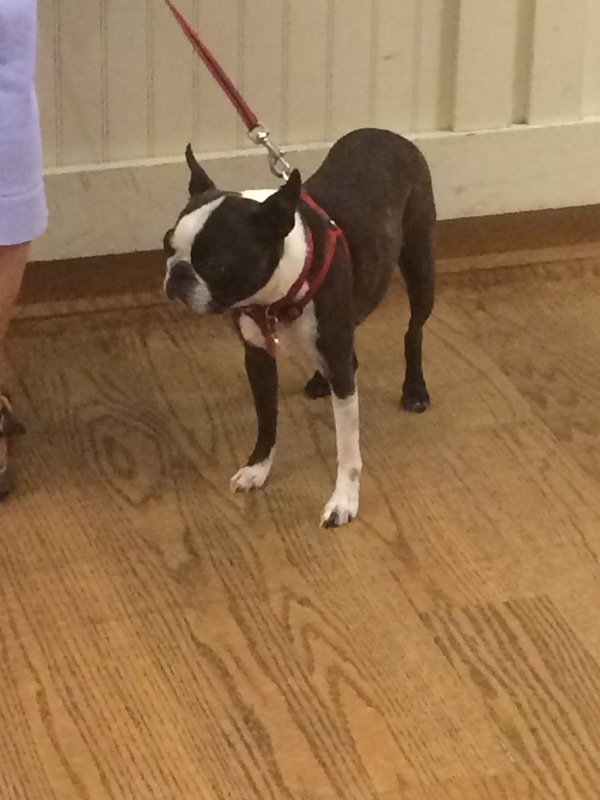 After a week of being here, I have a few observations about the place that I’d like to share. Biking here is hard. I mean, really, really HARD. I thought I was at least in decent shape before I moved here, being a pretty dedicated runner for the past few years, but there was one key factor I had previously overlooked: hills. This entire city is covered in pretty significant hills, which make biking (and running) a bit more strenuous of an activity than it was in Ohio. I have never felt so out of shape as when I was slowly pedaling up a hill, gasping for breath, while others whiz by me hauling up hills like Tour De France champions. Granted, they were probably also struggling a little and weren’t actually “whizzing by,” but that’s how it felt to me. The Runner’s Wave isn’t really a thing out here. You know, the one where you acknowledge another runner’s existence with a quick wave. The non-verbal exchange where you say “I see you out there doing your thing. Keep on keeping on, brother/sister!” while continuing your own run. Well, any interaction here extremely non-verbal, in that it doesn’t really exist. Occasionally, I will pass another runner who will smile or give me a nod, but I suspect generally they run by and wonder why this blonde midwestern chick is smiling at them like a fool. At this point it’s important to note that I feel as though people can tell I’m from the midwest–perhaps they can smell it on me, like the smell of farmland and corn and high school football or something. It’s not that runners are unfriendly here, but they are not overly friendly. It’s as though they acknowledge the others’ hustle without feeling the need to interrupt it. Which I respect, but I certainly need to adjust to that. Now, I’m probably looking for an overly-friendly runner because I’m in desperate need of running buddies, so I’m sure once I find those I’ll be better. People here are pretty great, actually. 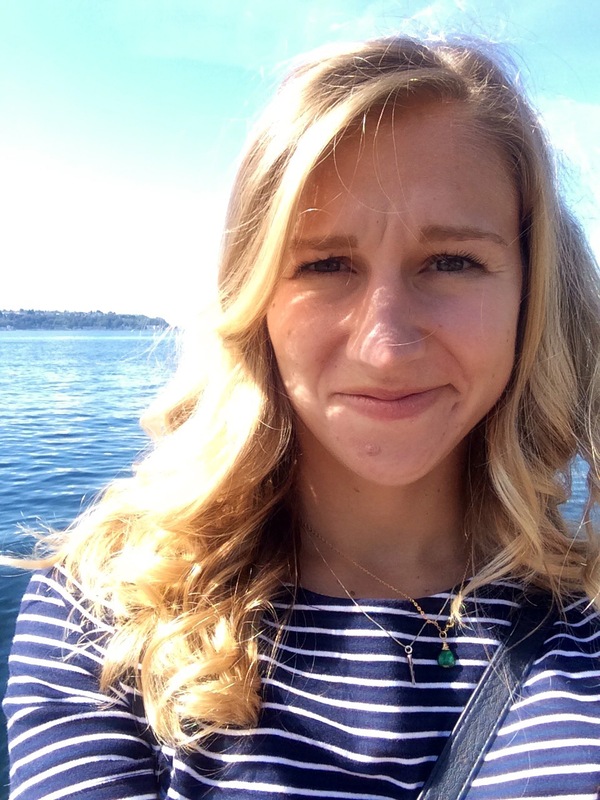 They’re not as unfriendly as people say–I’ve read about accounts of the “Seattle Freeze,” which means that locals are generally cold to other folks. Now, I’ve found that this isn’t true–people here have been warm and friendly for the most part so far, even when I admit I’m not from here (which, as I said above, I’m sure they could tell from a mile away). That brings me to my next point, which people have told me about other western cities before: that most people are not actually from here. 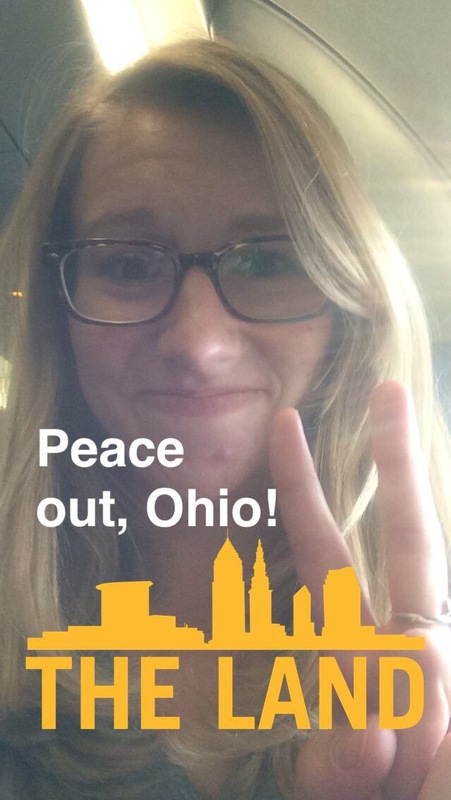 In fact, I met a woman from Northeast Ohio just the other day, and we talked like old pals about our hometowns. She welcomed me to the city, told me I made a wise choice, and then told me I could contact her at any time if I had any questions. Of course, I would–if only I could remember her name. Silly me. Seattleites do not feel temperature. Ok, so this might be a complete lie, but I feel like I’m missing something with the way people are dressed. Today, I went on a run in a sports bra and shorts–it was 70+ degrees, of course– and yet I passed a woman in full tights and a long sleeved shirt. This woman must have been overheating, as I was dressed for a much warmer temperature and yet I was sweating. But she was just carrying on as if nothing phased her. After passing her, I noticed another woman biking to work or to do some shopping or other leisurely activity wearing long pants and a sweater, again looking completely relaxed. Even last week on a colder day (mind you, it was still 55-60 degrees), some people on the streets were wearing light down jackets. Considering I was not wearing a coat and was feeling just fine, I was a little puzzled by this. Still haven’t reached any real conclusions on this, so I’ll have to investigate this further. I’m certain, as in the case with any first impressions, that some of these will change as time goes on and I become more acquainted with this city. I will, of course, add to this list in new posts as new observations candidly arise. P.S. 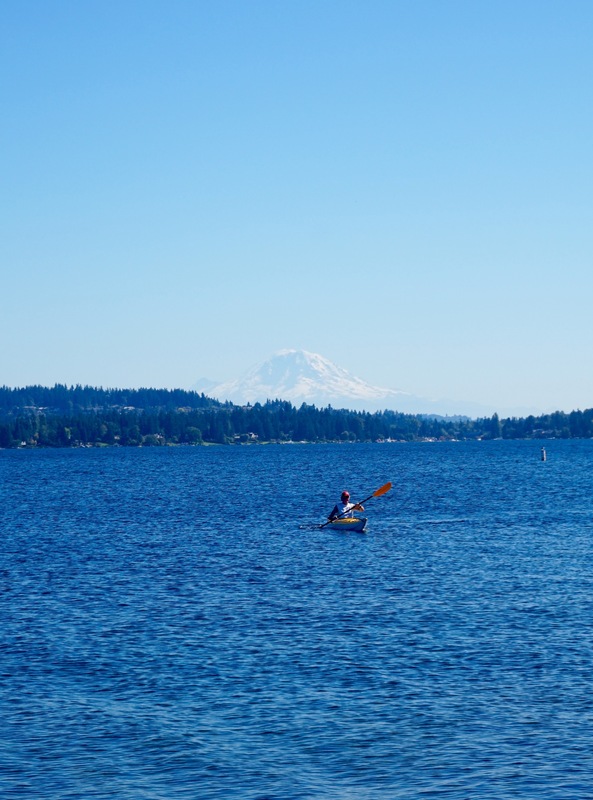 This post was sadly without a picture, so I’ll include this nice one I took yesterday at Lake Washington. I have had salmon for the past three meals. Yes, I’m eating salmon for breakfast. I suppose there are worse things to be obsessed with, potential for mercury poisoning aside. But salmon is everywhere out here, as it is a locally caught fish–there is even a Salmon Homecoming Festival that I definitely have to check out! Seattleites and Washingtonians LOVE their salmon. My parents’ last day here, we went to a local salmon place we found a few days previously. It looked like an awesome venue right on Lake Union, and, as seafood lovers, we were really excited to give it a try. The name of the restaurant was Ivar’s Salmon House, and from the moment we arrived it did not disappoint. The inside and outside of the building were decorated in the style of Pacific Northwest Native American Art (think: totem poles and canoes), and the interior was HUGE. 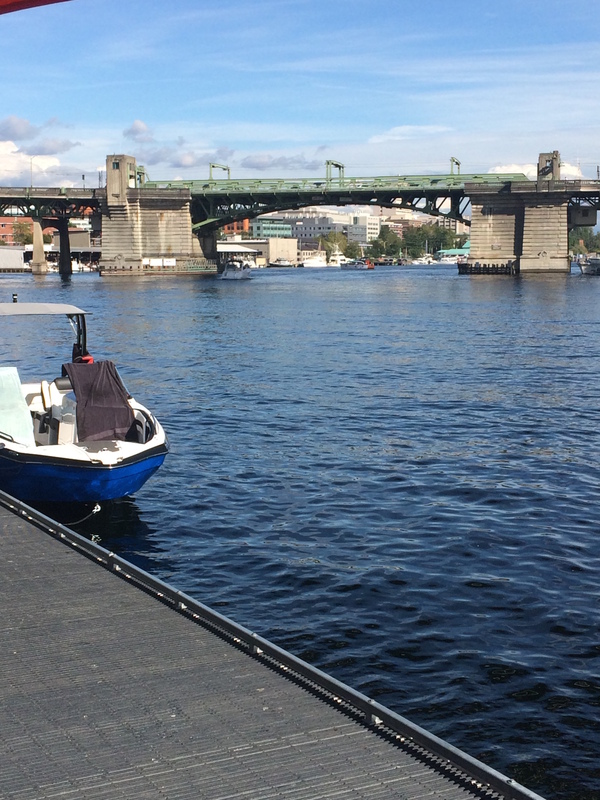 However, all of this paled in comparison to the outdoor patio where we chose to dine–right on the water of Lake Union, where you could take in views of the water and the city, watching boats go by as you enjoy your delectable fish entree. The only real negative was that the I-5 bridge was not far away, so you could hear cars whizzing by, but even that did not put much of a damper on the atmosphere. 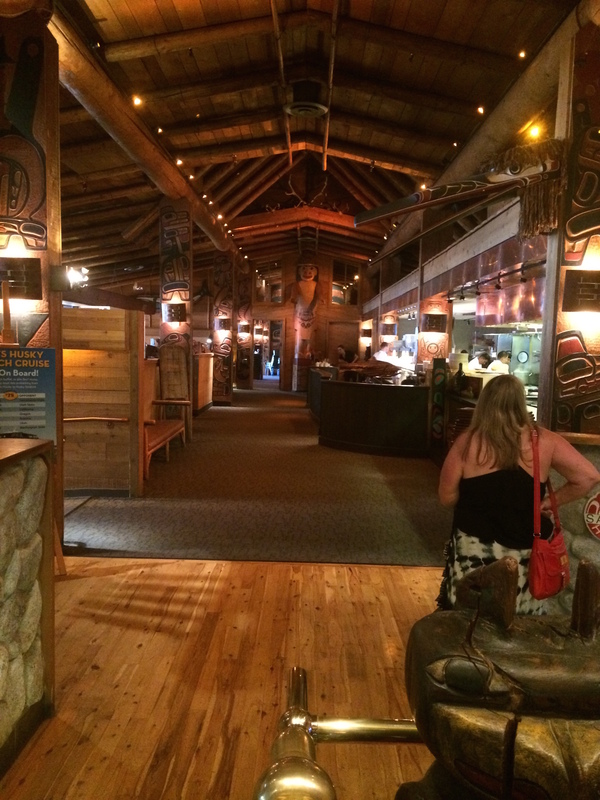 Northwest Tribal Art-Inspired Interior of Ivar’s Salmon House sets the stage for their authentic Salmon experience. 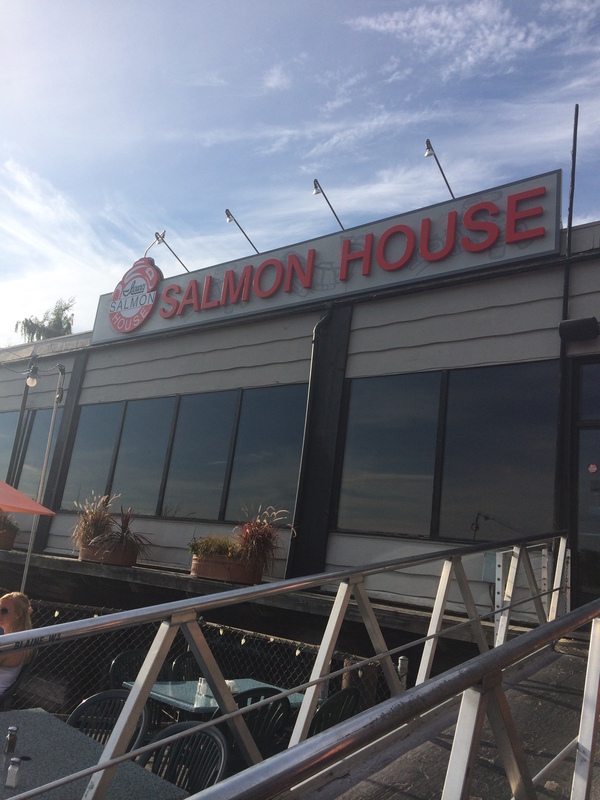 The waterfront patio of Ivar’s Salmon House was the perfect venue for eating seafood! If the views were all this restaurant had to offer, I would still recommend this place to a friend–the views were spectacular. However, the food was absolutely fantastic. 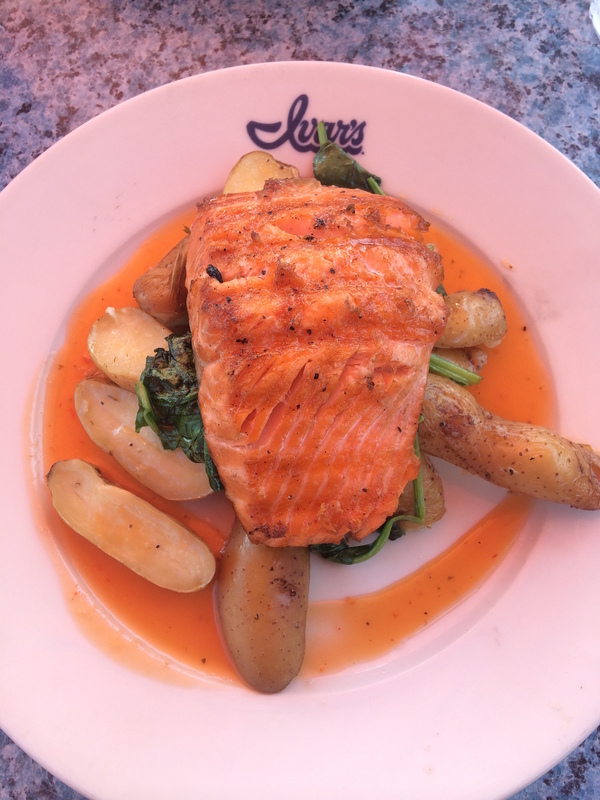 I ordered the Coho “Silver” Salmon, which comes with a papaya-ginger glaze, shallot roasted fingerling potatoes, and sautéed spinach. Wow, what a meal. I had to keep closing my eyes to ensure that the food was actually good and it wasn’t just the atmosphere that was altering my palate. But, indeed, this salmon was fantastic–among the best I’ve ever eaten. Their salmon was prepared using a special Native American method that gives the salmon a subtle smoky flavor–cooking it over an open fire of just Alder wood. The Coho “Silver” Salmon. Delicious beyond words. All in all, it was a wonderful, quintessentially Pacific Northwest experience. I would HIGHLY recommend this restaurant to anyone, local or tourist. Yesterday was an absolutely gorgeous day. It was sunny, the sky was clear, and it warmed up just enough to be the perfect, comfortable temperature. Like all of Seattle does when the weather is nice, I was dead set on enjoying it. My day started early by logging a few miles running on the Burke-Gilman Trail, a popular bike trail that loops through campus and links different parts of the city. It was a great way to see a different perspective of campus/the city while getting back into my running routine. Running here is entirely different than running in Ohio, however: the hills are insane in some areas, and everyone is so athletic-looking! Just being in this city makes me want to be a better runner, a better athlete. It’s remarkable. 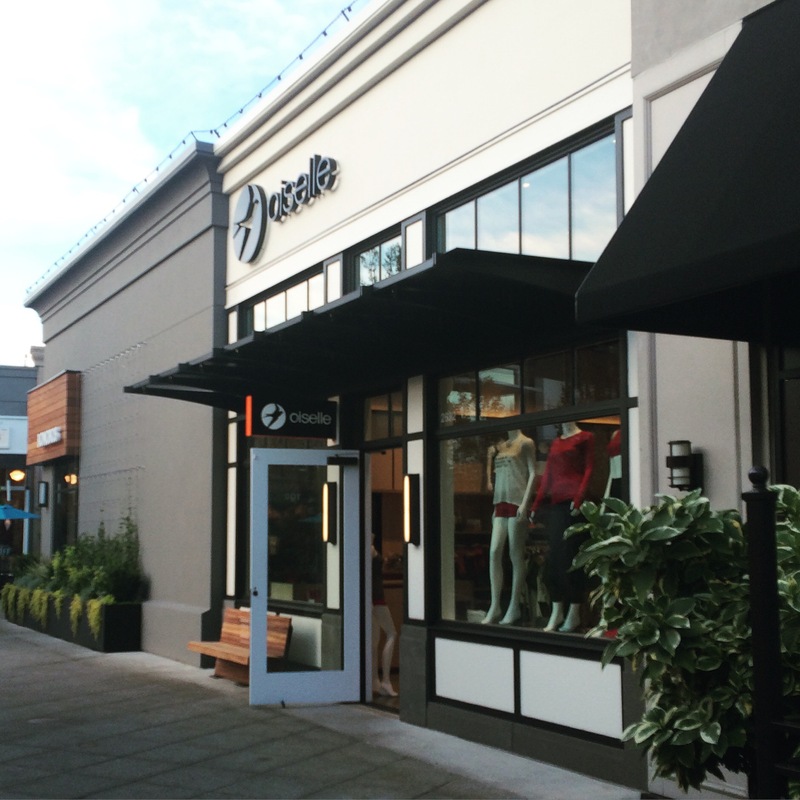 The first of many pilgrimages to the Oiselle store. What a wonderful little space! After a morning of browsing, I headed back to my apartment for lunch, and then packed a bag and biked to Gas Works Park, where I vowed to sit outside on Kite Hill and read until the sun was dangerously close to having set. Gas Works Park is an old Gasification plant that has more recently been turned into a public park that overlooks Lake Union. Beyond the lake is the downtown skyline, so the park promises excellent views of the city. Many people of Wallingford, the neighborhood of Gas Works Park, gather on Kite Hill to fly kites, picnic, play guitar, take photos, or sit and enjoy the sunshine and splendid views. While sitting on my plaid blanket, I finished my most recent read, The Ice Cream Queen of Orchard Street, a surprisingly delightful light read I picked up from Target on a whim. It was a welcome change from all of the heavy history books I had been reading this summer. It tells the story of a feisty, energetic immigrant woman and her climb to fortune in the 20th century through the ice cream industry. It was a breeze to read, and had I had more time to commit to it, it would have taken me a lot less time to finish it, despite it being around 500 pages. Definitely an enjoyable novel, I would give it a B+ or an A- if I were a book reviewer. 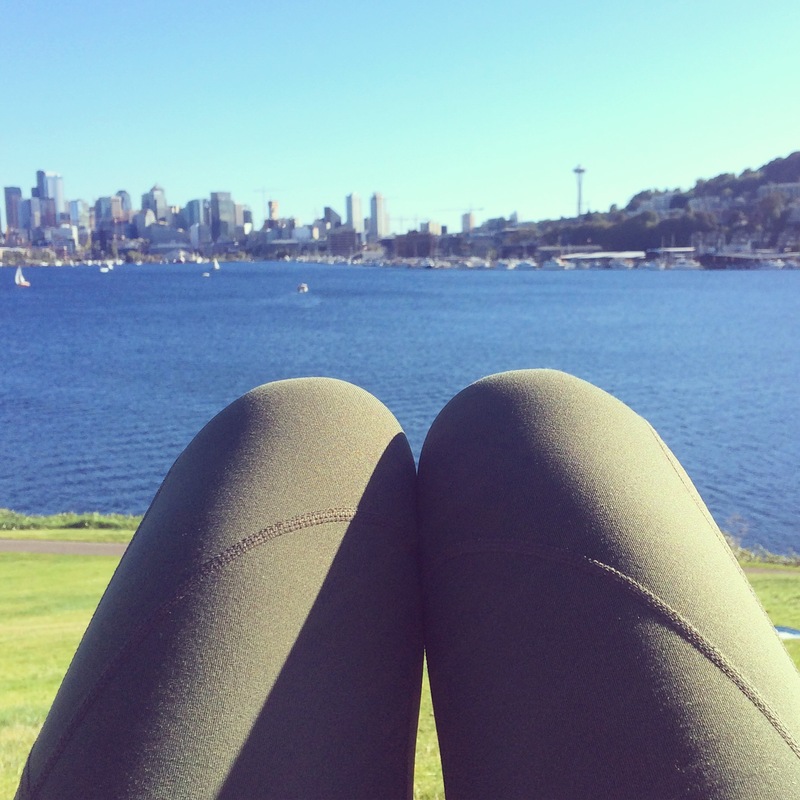 My view while reading in Gas Works Park. Hi there, Space Needle! Since then, I have been sitting in my apartment, working on getting organized and putting up decorations. My space is really starting to come together–it feels much more home-y and inviting! I can’t wait to show you all! Here’s to more days like this one! Wow! What a crazy first few days out here in the West! It was nice to have my parents out here for a few days while I got settled and adjusted to this new life and new home. While we made many, MANY trips to Ikea and Target (see photo below), we also had some time to do some exploring and sightseeing around the city. Of course, we hit up some local coffee shops as an energy source to fuel our moving-packed days. These, naturally, did not disappoint. A personal favorite of ours, The Ugly Mug Cafe (Here’s a review of it on SeattleCoffeeScene.com), is located only a few minutes from my apartment in the University District. This coffee shop provided all of the charm and comfort I look for in a coffee shop, along with a damn good cup of coffee. I ordered a Mexican Mocha, which was arguably the best mocha I’ve ever tasted: chocolate and espresso flavors, with a little cinnamon kick. It provided the perfect defense for a slightly chilly Seattle morning. Plus, the atmosphere of the coffee shop was exceptionally welcoming and shabby chic without being stuffy; this served as an excellent retreat from the bustling life in the U-District. 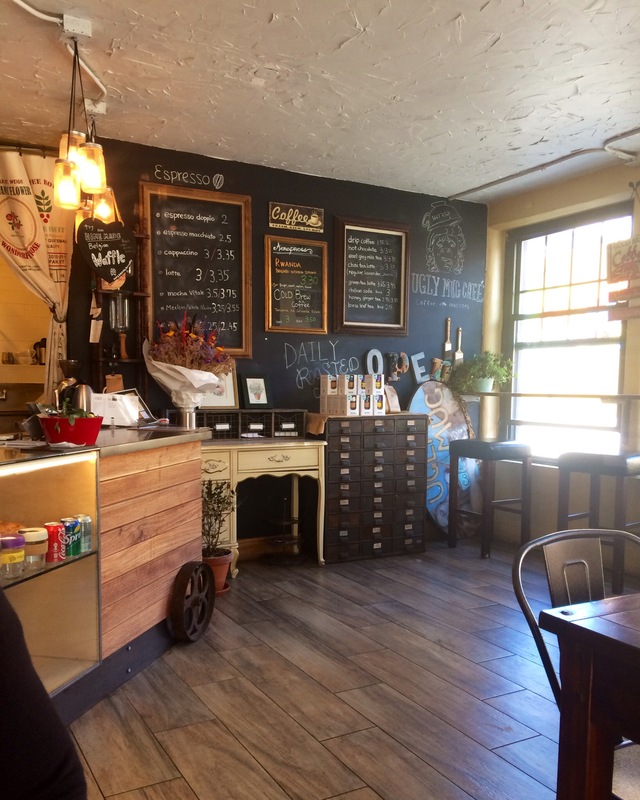 I can definitely see myself sitting in this little coffee shop reading a book or working on schoolwork and sipping on a delicious espresso beverage. A sampling of The Ugly Mug’s atmosphere. When we weren’t drinking coffee or carrying boxes or bags upstairs to my apartment, we also went downtown to see the sights and do some quintessentially Seattle touristy things. 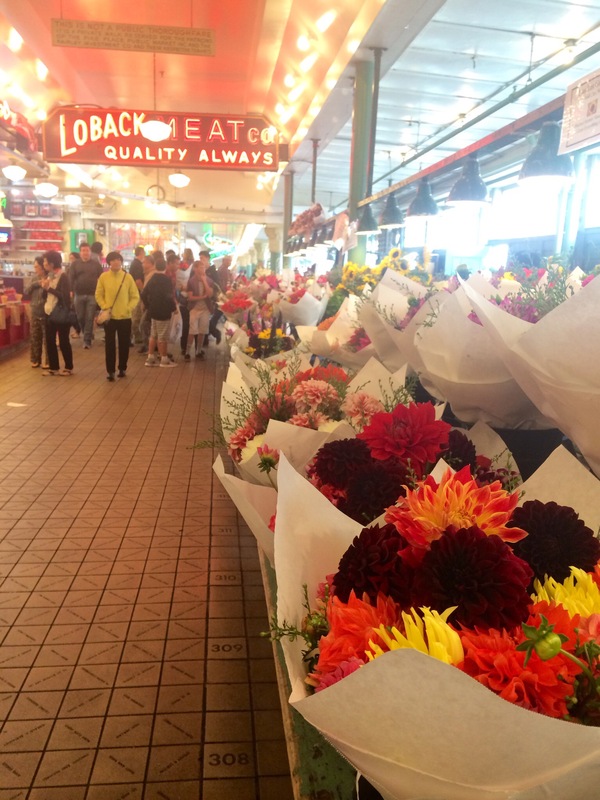 We, of course, paid a visit to Pike Place Market to check out the local food and wares for sale at this daily market. Only closed on Thanksgiving and Christmas and open since 1907, this market is essentially a Seattle institution, a place where locals go to get their produce and fish and also where tourists flock to people watch and buy local goods. While the food sections of the Market are great, I am always particularly captivated by the crafts sections–there are always truly remarkable things to peruse and purchase. I plan to return to wander around more, especially once I figure out how to avoid the crowds! The Iconic Pikes Place Market sign. A colorful flower stand in the market. The quirky gum wall outside the market. 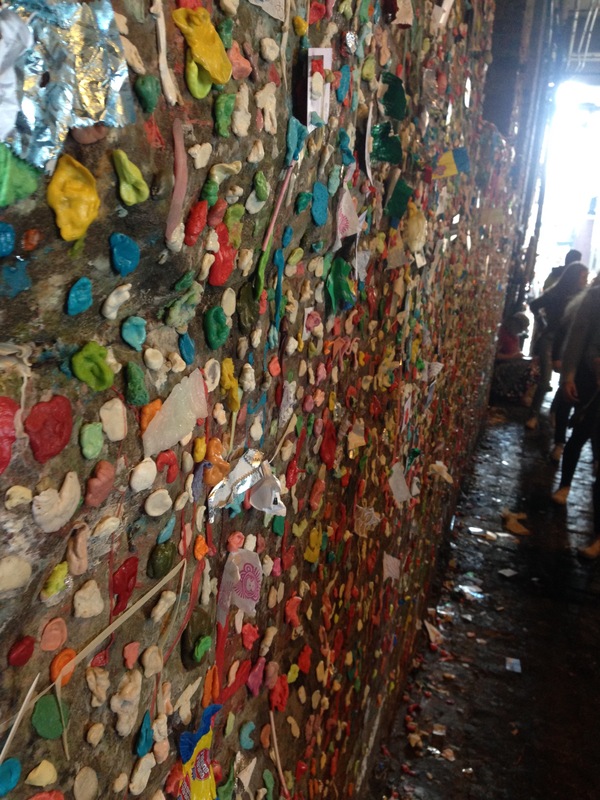 Many people come here to affix their chewing gum of choice to the wall. Certainly an interesting part of the local character! 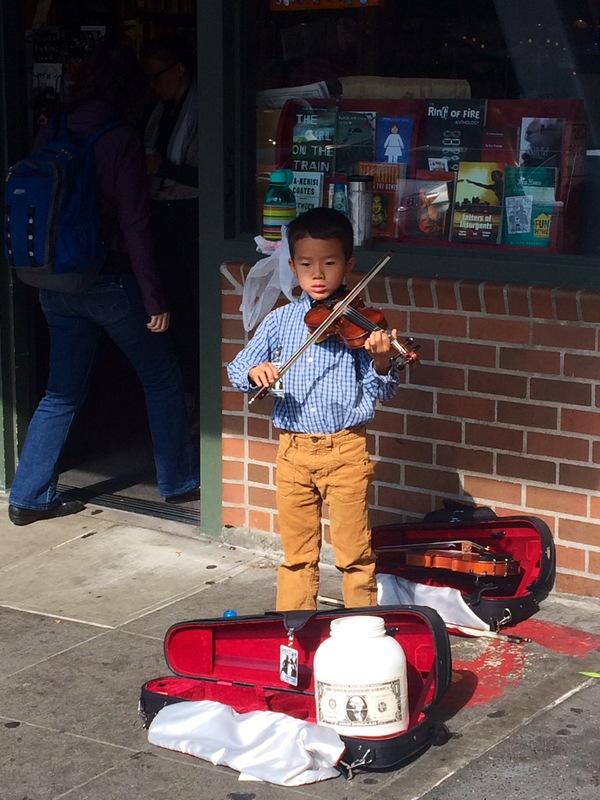 This guy was playing violin on the street to raise money for his family’s mission trip to the Philleppines. We were very impressed with his talent and his discipline. He stood so still and played his violin without fear, despite being surrounded by hundreds of people. We also ate at some wonderful restaurants. I will, of course, go into more details later as I would like to dedicate entire posts to what I’ve been eating and drinking, but I must tell you, the food culture here is great. Just about everywhere you look is a restaurant fully of culinary achievement. I am certain that you could come to Seattle and do nothing but eat and leave completely satisfied. I, myself, have eaten a lot of salmon since I have been here–it is one of my favorite foods and is much more readily available in the PNW than it was in Ohio–and it has been nothing but fantastic! It was absolutely wonderful to have my parents here in Seattle with me. Neither of them had ever been to the area and it was fun to see them enjoy this wonderful city. I cannot wait for them to return to visit! Changing time zones, that is. Whomp. The adjustment to a new time zone (three hours behind that of my home state) has proven to be a more difficult task than I had previously assumed. Between attempting to communicate with those still in the Eastern time zone at home to developing strange sleeping/exhaustion/eating patterns, the time has constantly been on my mind today. This struggle with time began Thursday night at about 10 PM PT/ 1 AM EST. After arriving at the Sea Tac Airport, my parents and I drove to our hotel, located a few miles north of the city. On our way, we resolved to drop off our belongings in the hotel room upon checking in, and then find a place to eat–our flight time did not allow for us to eat dinner before getting on the plane, and aside from a few mid-plane Sour Patch Kids and Peanut M&Ms (my personal favorite travel candies), we had not eaten since lunch, many, many hours ago. We quickly surveyed the area and discovered nothing was open except a nearby Buffalo Wild Wings–a local establishment you’ve probably never heard of. 😉 While we were at the restaurant and when we were heading back to the hotel, my dad kept asking what time it was. When I would tell him the local time, he would reply, “No, what’s the time back home?” My response was always a quick and honest “You really don’t want to know.” Because, mainly, it’s true. That’s the first thing I’ve learned rather quickly about dealing with the time difference: you do NOT want to think about what time it is back home. This will only make things worse: you will get more tired and/or will be even more confused or thrown off by the time. It’s best to live in the moment–but seriously, live in whatever time zone you are presently. This is truly the best way to adjust, or at least to cope with your jet-lagged exhaustion. Because it is. For now. I am looking forward to when I am more adjusted. But for now, there’s coffee. And, thankfully, I’m in the right city for that! P.S. I promise all of these posts won’t be be titled with references to music from the 60s. Or references to music in general. But, it is a pretty good song, so you might as well give it a listen. Tomorrow afternoon, my mom, my dad, and I will gather up our carefully packed suitcases and board a plane headed westward for Seattle, WA. I will say ‘see you later’ to my wonderful dog, my hometown, my home state, and everything I know, and will catapult, almost blindly, into a new life–new city, new state, new region, all very foreign and unfamiliar. Am I anxious? Certainly. Am I excited? You bet. Am I ready? We’re about to find out. Pacific Northwest, here I come! I just finished having a phone conversation with my best college friend and sorority sister, K. We chatted about news in her life and my big flight tomorrow, laughing in our usual way and wishing for a time machine to transport us back to freshman year at John Carroll. It was so nice to hear a familiar voice before my trip–it certainly made me feel better in this anxious time. I cannot believe how much we’ve grown up, even in the past year since we lived together! I’m so thankful I have a friend like her who is always there despite the crazy swirling changes going on in our lives. It’s friends like these who remind me that I will be ok, that I will be supported down any path I choose. More later–I have to go finish packing! So a lot of time has passed since my last post. Naturally, a lot has happened. I’ve attempted to keep busy in anticipation of my big move. I’ve been making lists, completing tasks, and trying to get my life at home together. I got a summer job, working part-time in the retail world, which I surprisingly love. 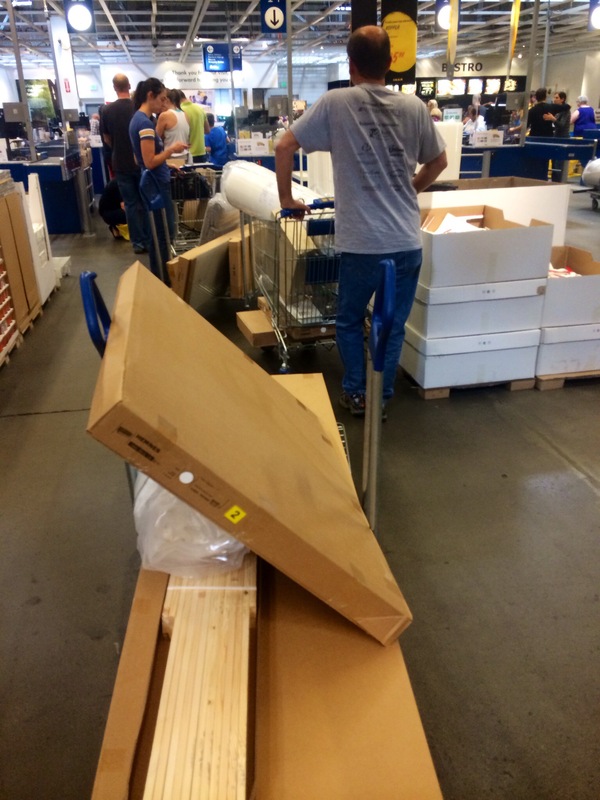 It’s fun to see the other side of stores, the behind-the-scenes, day-to-day functionings that bring the products to the customers. Plus, the extra income will be greatly appreciated when I’m in a new city. I’ve continued to run, increasing my mileage slightly each week to get myself to better physical fitness and mental state. I’ve also been including yoga in my week, sometimes practicing two to three times a week. While all of these things are great, it also feels like my life is at a standstill. I’m between places, without a permanent home. I’m not quite in Seattle, but I’m not quite at home, at least not for very long. I have all this anxiety and anticipation about my impending move, but it is still over a month away. I feel uneasy with all of this impending-but-not-too-impending change in my life. I suppose the best way to deal is to live in the everyday and not think about what is to come. At least, not too much.